Corel revolutionized the graphic design industry when it introduced CorelDRAW? in 1989. Today, the Company continues to lead the market with its award-winning graphics and productivity software. 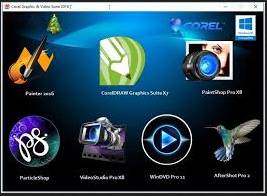 Corel is also at the forefront of the digital media revolution, delivering the industry's broadest and most innovative portfolio of photo, video and DVD software. Graphic Design Fundamentals Must Watch in 2019 . Ezee Graphic Designer 2.0.22.0 .